mound fanning it’s roots out evenly around it. We added dirt until the roots were covered and compressed the plant down into the ground. cans cut in half, and press them down 2 inches or so into the ground. Last we watered the strawberry plants with about 2 cups of water to each plant and mounded the dirt up around the can. 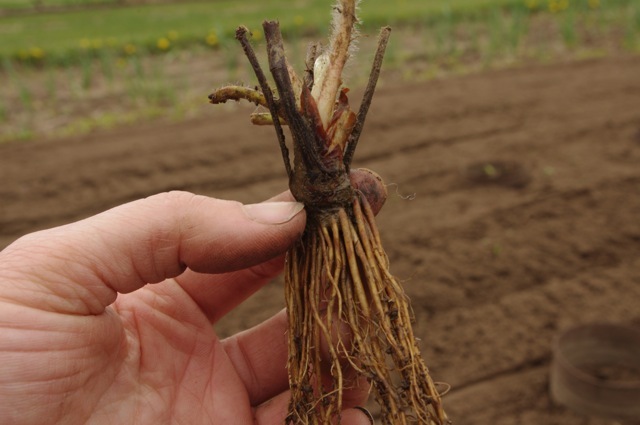 Cutworms travel through only the top inch or so of soil, but will gnaw right through the stem of your little fledging plants, felling them like trees. We won’t get any strawberries this year. The recommendation is to thin the bed each year after harvesting the berries to a 12 inch wide row. Like grapes, I guess strawberries do better when they are “pruned” back.